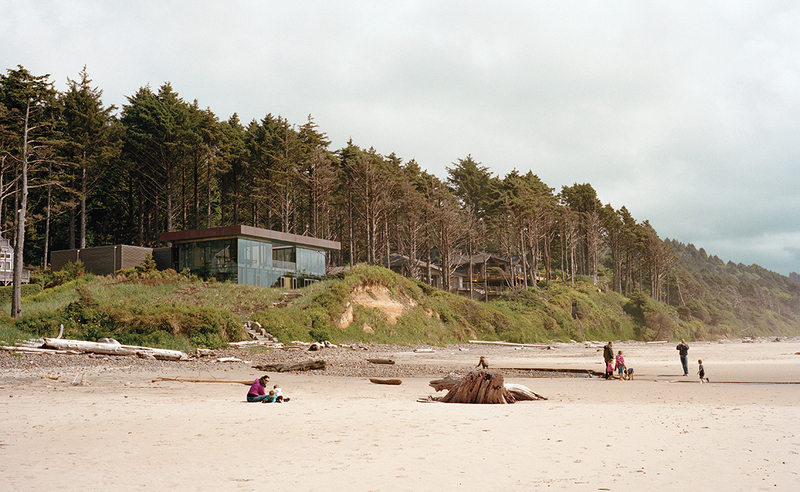 Seeking a respite from the city, a Portland couple create a beachfront getaway on Oregon’s rugged coast. Boora Architects designed a house for Ryan and Mary Finley near Cannon Beach, Oregon, that resembles a glass prism and rises above a shallow cliff overlooking the Pacific Ocean. The 3,330-square-foot structure is topped with a green roof. In this Portland home, design firm Made arranged individually carved white-oak planks in a geometric pattern on the ceiling that repeats itself throughout the house. 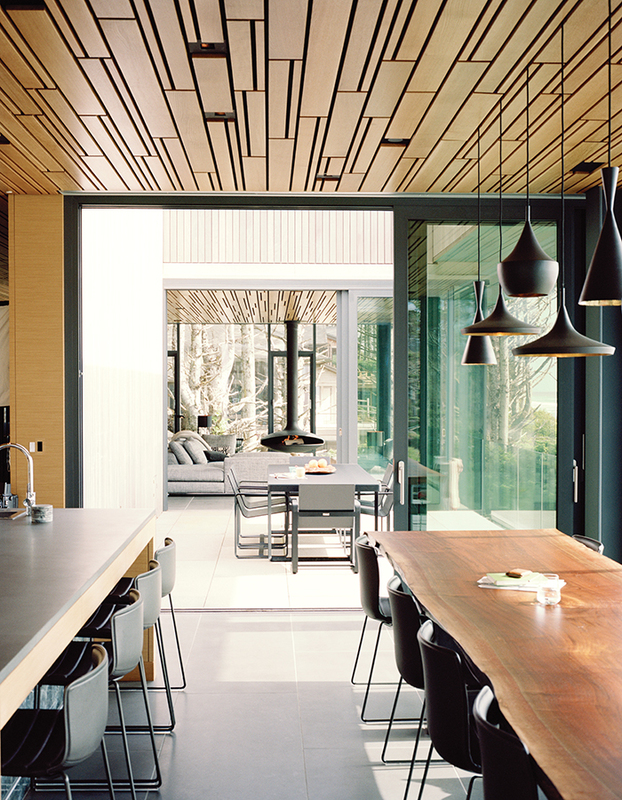 Beat Light pendant lamps by Tom Dixon hang above a custom dining table, also by Made. Architects Stan Boles and Christopher Almeida arranged ten-foot-tall panes of glass in a steel curtain-wall frame to create the building’s distinctive facade. The brass sculpture on the gray basalt tile floor is by André Bloc. Gray basalt was also used for the kitchen island and backsplash. 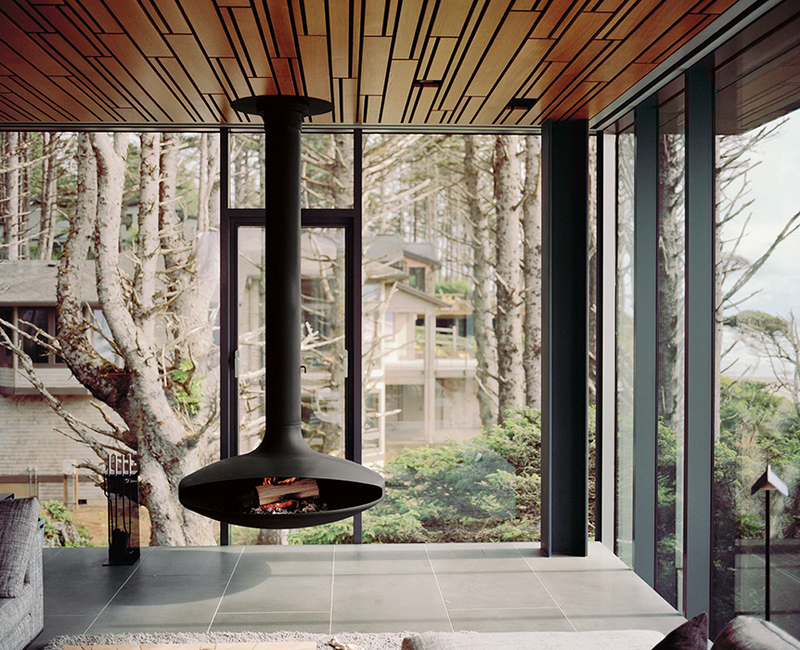 A wood-burning stove by Euroflues is suspended from the ceiling in the living room. The glass curtain-wall system that surrounds it was a year in the making. It was painstakingly designed and tested so it would hold up to punishing winds off the Pacific Ocean that can reach 120 mph. The linens by Matteo Los Angeles in the master bedroom were among the fabrics that Mirjana Munetic of Boora selected for the Finleys. The idea was to find neutral tones that would not upstage the views. “We wanted the exterior to be the artwork,” Ryan says. The 3,330-square-foot house was a long time in the making. Ryan bought the site on a whim in 2005. The founder of the Web company SurveyMonkey, he was living and working an hour away at the time in Portland’s trendy Pearl District. Cruising down the coastal highway one day, he spotted a for-sale sign on an acre of land. “I didn’t want to pass it up; it had such an amazing view,” he says. “Buying it was a little impetuous.” He then hired the Portland firm Boora Architects and really came to grips with his hasty purchase, as zoning issues ensnared the architects in design hearings for the following two years. After the dust settled, the architects were limited to a specific building footprint that dictated the home’s form as a basic rectangle. Apart from its shape, however, nothing about the home is bland. The architects designed the two-story house to be made up of ten-foot-tall glass panels—some six feet wide, others three feet across—slotted within a steel curtain-wall frame and topped with a tufted green roof of native grasses and ferns. “It’s as if we literally made a cut in the ground and pulled up the earth so it’s levitating on top of this glass prism,” says Stan Boles, a principal at Boora who worked on the house alongside Christopher Almeida, the project manager. Building a glass house in a remote beach location presented a challenge, however. In the six years between the purchase of the lot and the completion of his home, Ryan met and married Mary and sold his company. The couple also designed and moved into a new condominium in the Pearl—all while still working with Boora on the beach house. Contractors and craftspeople were brought in from Portland, many of whom ended up renting houses nearby while they completed their meticulous custom work. The three-paned glass curtain-wall system alone took over a year to make; the designers detailed it inch by inch to make sure it fit and could withstand the 120-mph winds that sometimes buffet the house. “It was a really long process,” Mary says with a laugh. The result is an impeccably crafted home that perfectly blends into its surroundings. “We didn’t want anything to stand out,” Ryan says. “We wanted a neutral palette and all-natural materials, because the real artwork in this house is outside.” Long, lean lines in the house mimic the horizontals of the surf, the grass, and the beach. Six-foot slabs of gray basalt tile cover the floors, then creep up the kitchen island and countertops. A cantilevered steel-and-white-oak desk floats along 25 feet of the glass downstairs, where Mary and Ryan sit with their laptops, looking out onto a field of ferns carved into the earth. 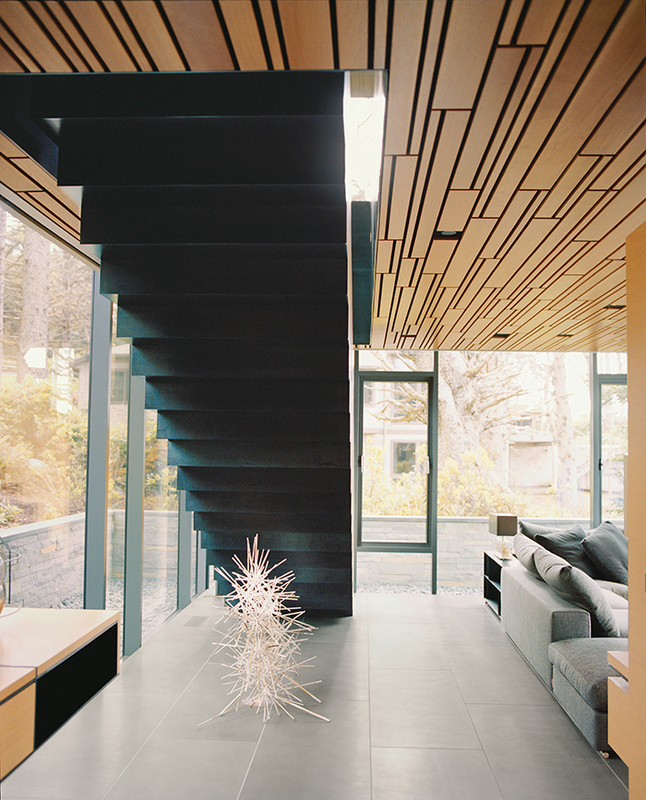 The ceiling is a masterwork of individually carved wood planks, of varying sizes, laid in a geometric grid by the Portland design firm Made. Instead of interior walls, wood cabinetry and shelving—attached to the ceiling and exterior by glass panels—divide the rooms and further extend the view outward. Downstairs, Doug Chamblin Furniture made beds, bedside tables, and benches from white oak that mimic the rocky protrusions and shallow caves of the seaside cliffs. Couches and coffee tables lie low so as not to disturb sight lines. The couple worked with Mirjana Munetic, an architect at Boora, to find natural fabrics and linens in neutral colors and textures that blend with the outdoors—nubby wool Maharam throw pillows scattered on couches in mossy greens and taupes; pure cotton bed linens by Matteo Los Angeles in warm grays and creams; and black leather on the dining room chairs. A few flashes of high-tech fun nod to Ryan’s computer-programming acumen. The 900-pound glass entry door was custom made with all of the moving parts and mechanisms visible. The powder room is outfitted with a Numi toilet by Kohler that has its own sound system and automatic flush. And the built-in Lutron window shades lower with the touch of an iPad screen. There’s even a commercial-grade blast chiller by Irinox to keep food extra fresh—a request from Ryan, a seasoned cook.